Three parcels totaling 8.59 acres in the City of Edgewater. There are +/- 1,400 feet of US1 frontage. Parcels may be split into increments of 3.98 acres, 3.69 acres and 0.92 acres. The properties are on corners of Silver Circle/US1 and Oak Branch Drive/US1. 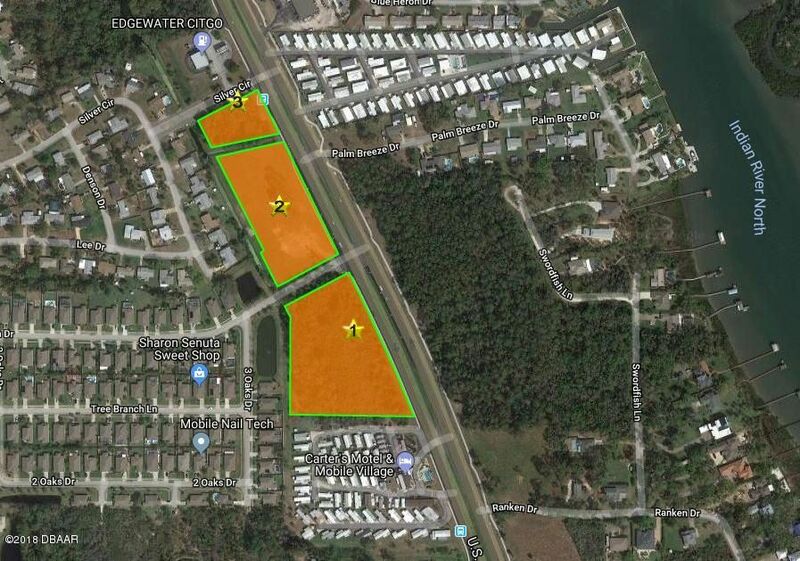 Edgewater B-3 Highway Commercial zoning allows for multiple uses including: Retail, Auto Repair, Boat Sales, Health Facilities, Machine Shops, Medical Office, Nursing Homes, Personal/Professional Services, Restaurants and Schools.Hotel/Motel use will be restricted on these sites. Seller Financing will be considered.